We are the leading PPC agency in Delhi/NCR, India, offering guaranteed increase your ROI. Our PPC services offer by Google certified PPC experts can deliver maximum leads and sales within thirty days. Pay per click is one of the most effective ways in which advertisers need to pay some amount of money recommended by Google for certain keywords to generate leads. PNJ Sharptech is a well reputed PPC management agency in Noida, India specializes in professional PPC services. Our well-managed PPC ad helps your business to get maximum ROI and sales. Google PPC ads are used by millions of small-midsized and large business houses all over the world. It is one of the most cost-effective ways to increase sales, leads, and drive traffic to your website. So how does PPC advertising with Google precisely? Paid search advertising such as sponsored ads, pay-per-click marketing, search marketing, cost-per-click marketing, and search engine marketing. In these ways, displays ads in the search engine result in someone searches for the products or services offered by the advertisers. Thus, the ad displayed suits perfectly each query. Display advertising is one of the most powerful ways that place your ad in the middle of your targeted audience. It helps to send a commercial message with the help of logos, text, videos, photographs or other graphics. Display advertisers regularly target with specific traits to increase the effects of ads. Social media advertising is the best way to advertise your ads on popular social media channels. In this way, advertisers have to pay to the social media company to display their ad on social media platforms. It may be your display ad, a promoted tweet or other displaying of products or services. Mobile Advertising is a cost-effective way of advertisement through mobile phones or other devices to send marketing messages to customers. It is promoted by the marketers to advertise inside of SMS messages, banner ads on mobile sites. also, placing an ad in a mobile application like a news app or game. Google Shopping ads, also called Google product listing ads, especially design for e-commerce retailers to sell their products online and drive the traffic to their e-commerce stores. It helps to place the products at the top ten pages of Google search results. Google AdWords remarketing is the best advertising way to improve the personalization and relevance of the ads shown. It enables websites to display targeted ads to users who have visited already their websites. Our Smart PPC Management & Recommendation Services can save your money & time. To expand the business from the small to the largest empire, you need to drive the traffic to the site but it is not easy for you. PNJ Sharptech offers top-notch PPC management services for small to largest business corporations. It includes e-commerce, health, real estate, and many others in very affordable prices. Our main aim is to refine the keywords that make the search procedure simple and quick. As a result, online visitors can gather on the websites of the customers. you should avail of our best PPC services Noida, India, to improve your business leads and sales. Being a well reputed PPC agency in Delhi, India, we have many years of experience to run successful PPC ads campaign across the globe. Our PPC expert always use professional tools to make accurate keyword analysis research for the client’s business. Our PPC professionals have the capability of recognizing the most relevant keywords that can generate a lot of queries and leads. An ideal title, short summary, description, statistics and keyword rich URLs are the key parameters for a successful PPC campaign. We use this strategy properly that assures a high ROI for our valued customers. Our PPC experts use cost-effective strategies to generate more client leads and sales. Our latest and matchless strategy for a successful PPC campaign is quite different from others to make your business prosper. 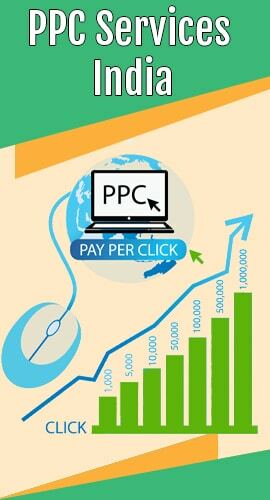 Our team comprises of Google certified PPC experts, who have the mastery in reducing total cost per click(CPC). Suggesting the alternative option in the place of costly keywords certainly important for the bidding process. We have many years of experience of handle PPC campaigns so we can suggest bid on certain keywords. As a result, it is very helpful to reduced cost and increases ROI. Bids are regularly monitored on certain keywords yet least competitive by our dedicated team. PPC is certainly an expensive process. So we ensure that you get a higher ROI of each and every PPC campaigns with the help of correct and certain keywords. Our PPC experts can do for you to improve the efficiency of PPC costs. Campaign report management is one of the most important parts of our campaign reports. The reports are daily monitored and delivered to the customers within the time limit. We use advanced PPC strategy to improve the overall efficiency. We change the right parameters after viewing many prospects and data given by campaign report managers. All business owners cannot pursue legitimate inclination to wait for a higher search result because of some business sale and lead collapse to some extent. It does not imply that they should leave their expectation to retain maximum marketing leads. No doubt, there has come an uncertain change in the market for accessing the improvised result beyond the customer’s expectation. Additional business marketing technique without spoiling quality time to go through with exceptional marketing leads tagged as a pay per click (ppc). In fact, PPC is one of the acceptable ways to quickly find the targeted audience on your startup business horizon without doing extra efforts. How to Generate Business Leads & Sales with The Help of PPC? Generating leads and sales for all size business houses with the help of PPC ads is very simple. Follow the simple steps offer by PNJ Sharptech to make it possible. Since PPC service has been loaded with such a speechless perk, it is obvious to search the one-stop solution for enjoying the instant sale with a healthy contribution of click-through rate (CTR). No need to move ahead for taking the true incentive of inorganic service as the PPC team member of PNJ Sharptech consists of full confidence to satiate lead generation requirement more effectively and efficiently. In order to avoid deceiving expert, it is better to cast an insight on leading organization for best PPC services at your charming and comfortable capital value. The next step of the passionate customer is to scratch the leading PPC service providers name. Instead of staying the tempting offers to earlier established companies, you can last your query for instant marketing with us. As for the feedback of previous customers, our organization is recorder the second to none organization. Our well designed PPC campaign enables not the only customer to obtain a quick sale, but also offers the solid reason to choose it against SEO process. Our PPC expert strategically implements the PPC ad campaign. All individuals can avail the feasible and required advertisement campaign on the relevant search engine to grow business behaviors quickly. In addition to this, we have marketing experts who help you to suggest keyword which lets the targeted audience to do the search to see the ads and click on it. Buying a few substantial advertisements would be the ideal approach as it encourages a potential client to see it on their first glance and stop it for a time. This is the best way that customers are bound to see your business. So, you should not further delay for hiring PPC campaign management services launched by us. In comparison with other online business marketing, we are charging reasonable rate in avenge of picture perfect and justified PPC Service Campaign. We strongly recommend the latest strategy for numerous clients ranging from diverse industries for handling a successful PPC campaign. Our PPC management and recommendation services are up to date, efficient and result oriented in order of lowering the budget but generating more queries or sale lead over a short period of time. We also keep an eye on the competitor’s strategy.